A year and a half ago I read this article on fat-bike.com about the up and coming Juggernaut Pro 4.0 tire which promised to revolutionize the fat bike tire market. The new Juggernaut Pro tires had a pretty deep tread pattern but at less than 800 grams, were much lighter than any Fat Bike tire currently on the market. There was a lot of skepticism and excitement in the fat bike scene. Unfortudently it took forever for these tires to actually get to the market, and for over a year and search that I did on the internet for Kenda Juggernaut came up with the older heavier 1400g 4.0 inch tires which were heavier than most other 4.0 inch tires on the market. I patiently waited. 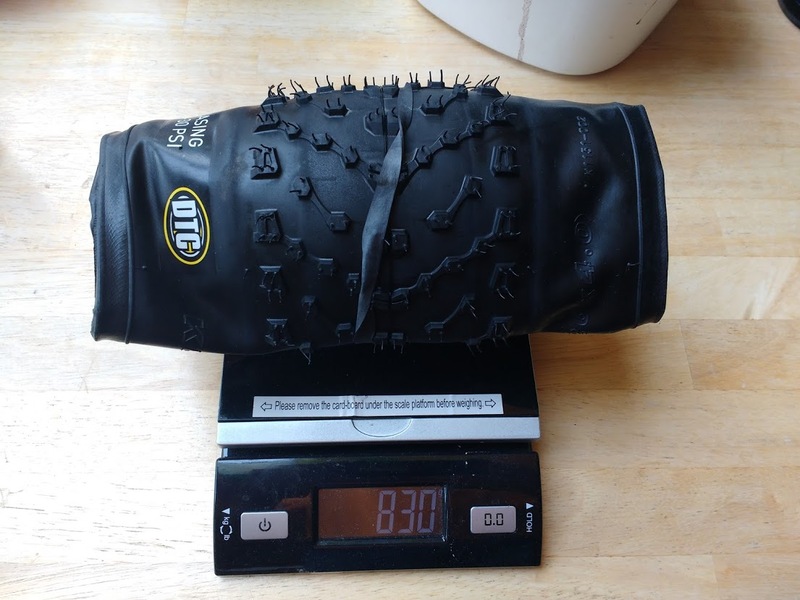 This is the lightest 4.0 Treaded fat bike tire made, it is also the most worthless in my humble opinion. Finally, I saw one pop up on the internet for a mere $59 and I pounced on it. In retrospect, it was a pretty bad idea, when the tire arrived it was indeed lighter than any fat tire I had ever laid my hands on. The sidewalls felt like tissue paper and so I mounted it ghetto tubeless on one of my full suspension electric fat bike builds called Rebel Scum. The wheelset was impossibly light and I have to admit I was really giddy to see how it was going to perform. I made it about a mile into the woods before a branch tore a huge 1-inch hole in the sidewall of the tire and I ended up having to carry the bike a mile back to my car. I was not amused. So this is the part where I rate the tire and how well it performed in a variety of surfaces on a scale of 1 to 5. I’m going to skip this part and just tell you to save your money and buy something else. If you’re looking for cheap and light nothing beats the Panaracer Nimble B that I can find yet. You can score one of these folding bead tires for around $50 on the internet and they are worth every penny. 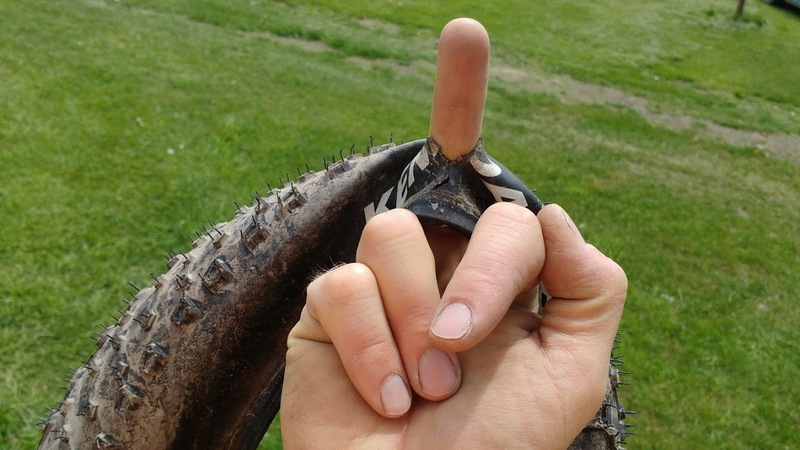 The Kenda Juggernaut Pro disappointed me like no other tire ever has. You know where you can stick this tire. Like Noam Chomsky says in his re-paraphased song by Public Enemy … Don’t believe the Hype. Chomsky, Public Enemy and fat bikes. Let the meme insurrection begin. I just lost a Surly Lou to a rock puncture in the tread area. I heard it go so I walked the road looking for a nail or glass. But a rock had punched a huge hole. $130 loss, very disappointing.. I’m trying the Jumbo Jim now. I’m not sure why someone thought a super-thin tire intended for off-road use was a good idea. I do wonder if a smoother/reverse tread variant for city/urban/suburban use might make more sense, though. I guess I’m just not the smartest peanut in the turd. Yes but what else do you use a fat bike for if not dirt and offroad? Surely the manufacturer didnt think this was going to be used purely on paved smooth surfaces? I’ve found an electric fat bike can be surprisingly useful for urban utility riding. The fat tires are great for dealing with poorly maintained pavement, and a BBSHD gives it a good turn of speed and the ability to easily carry a load or pull a trailer. I would love to see review on the more budget friendly Kenda Juggernaut Sport. I would assume that since it’s not that light as the Pro version, it could be more durable. This is what we use for our Voltbike Yukon series and so far we don’t have any tore tires. Its coming. Patience young Jedi. My fatbike has kenda krusader sports (4.0×26). I’m hearing the sidewalls on these are not too tough when it comes to sticks and jagged rocks. Can anyone recommend a tire to be considered tough against these things as potential replacements? Something in the $100-$125 range is preferred. Please tell me where I can but Kenda 20×3.0 tires in Australia I have a A2B ebike.?? ?